A few weekends ago I returned to SGL 57 and Flat Top. I wanted to see if there was any fall color remaining at the higher elevations. It had also been a year since I was at Flat Top, and it was time to return. Wes joined me and we made the hike up from the White Brook parking area. The sky was overcast. On the hike up, we saw a bear and two or three cubs higher up the slope. We made our way to Flat Top Vista and the clouds retreated, revealing blue skies. Yellow and gold clung to the valley, but the higher elevations were mostly bare of color. We bushwhacked up the plateau, reaching some cliffs and ledges. We followed these ledges with their small caves and crevices. Soon we reached the largest cave. Wes went in, travelling deep into the rock and the darkness, his headlamp offering the only light. He went a ways back and soon returned, reporting the cave continued even further. I presumed any bear would be out feeding instead of sitting in a cave, but I still didn’t feel like entering the dark void. Maybe some other time. Our hike continued along the rim of cliffs and soon we were at a fascinating rock house where a narrow shelf of bedrock creates a roof over a “room”. Another overhang was nearby. 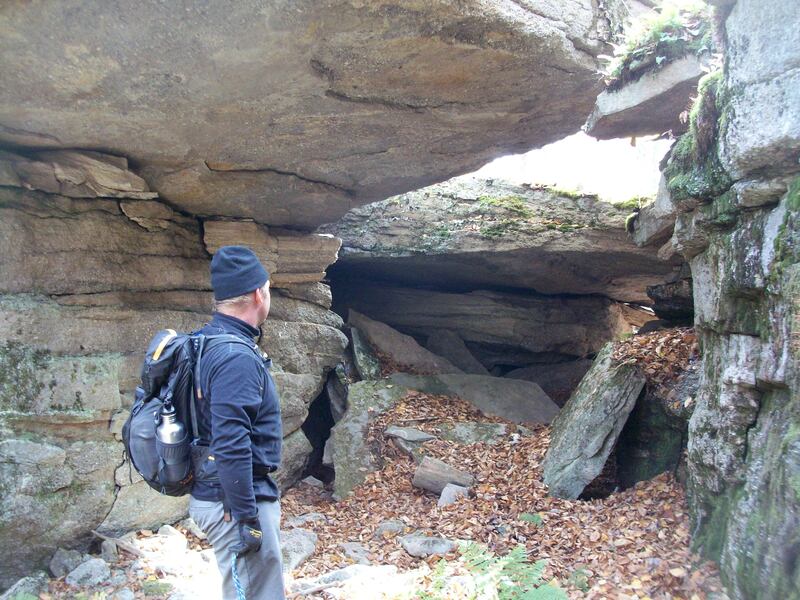 I dropped down into the crevasse to explore the rock house and stepped on a large boulder. The boulder wobbled with ease and I scurried off as soon as I could. I had visions of the boulder shifting and trapping my foot. I wasn’t quite in the mood for having my foot trapped and entertaining the thought of gnawing or amputating it free like that guy had to do with his arm in Utah. Thankfully, I had someone with me. We entered the rock house and it was a very scenic place. Cushions of moss and draperies of ferns covered the rock. A spring dripped nearby. These rocks had been separating for eons, and will continue to do so. From there we made our way around the rim of the plateau, exploring more of the boulders and crevices. We pushed through the forest and soon reached the western rim and a series of cliffs and deep spruce forests that mark the beginning of several vistas of the Endless Mountains. 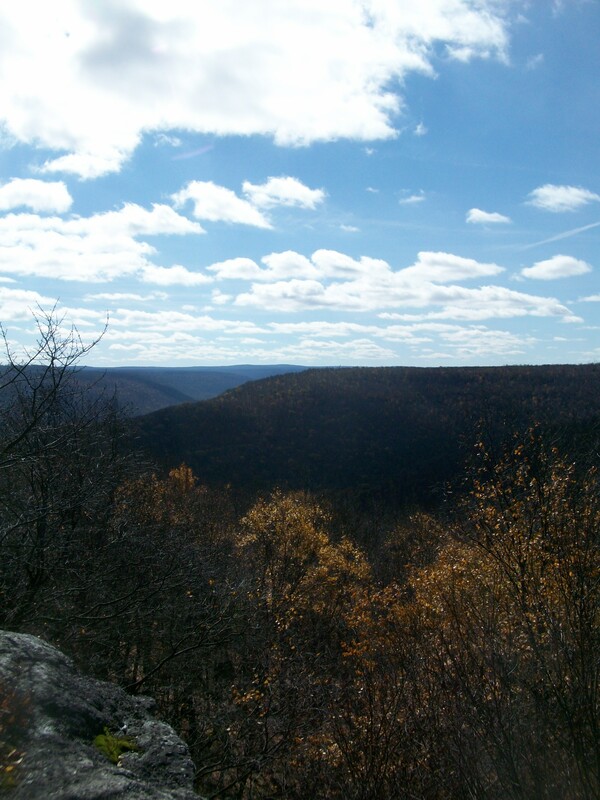 The views were beautiful as ridges and mountains disappeared into the Mehoopany Creek valley. There was no sign of development, everything appeared untouched. This place seems so wild and primeval. The sun glistened in the deep blue sky, chilled with a constant wind. We hiked down to the creek and took a break at a waterfall. The hike brought us through hemlock forests and across one of the balds. We were soon back into the hemlocks before reaching the headwaters of White Brook. The understory in the forest still had a lot of color with various shades of yellow. The long descent down the brook followed as the sun set across the Mehoopany Creek valley. 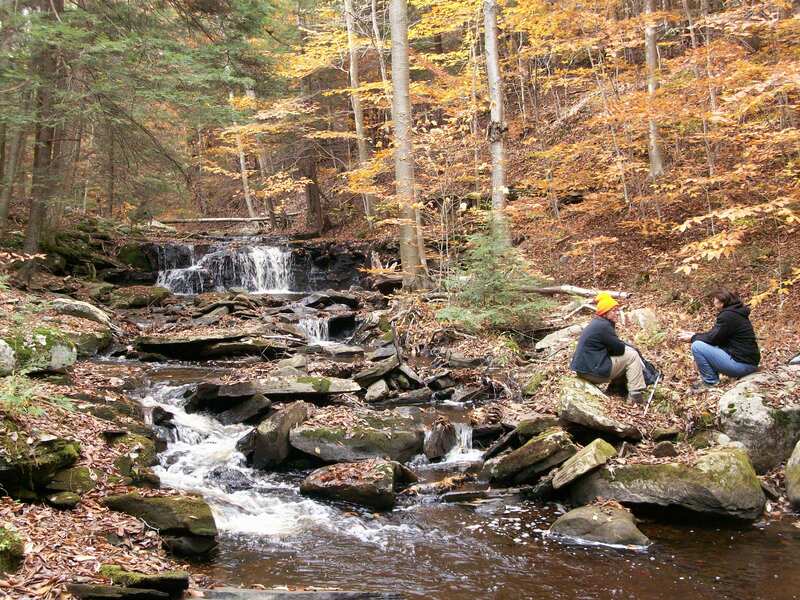 The northern part of SGL 57 is among the most scenic and diverse places in the entire Mid-Atlantic. I can only hope it remains that way. Part of this hike is described as Hike No. 14 in Hiking the Endless Mountains.